1) change the XML UID by editing the XML file within the Exported VM directory. I recently came across this issue on one of my virtual server machines, where I just setup a brand new Windows Server W2K12R2 Update 1 virtual machine. It is currently in DHCP status soon to be set as a static IP. Client: Windows Server 2012, R2, Update 1. Standard Server. Virtual Machine version 5, generation 2. Network: High quality CAT6/Gigabit setup. This new VM has a “DYNAMIC” MAC address. All the other VM clients on that server have STATIC MAC addresses. I shut down the VM, adjusted the network settings (under ADVANCED) to a STATIC MAC. 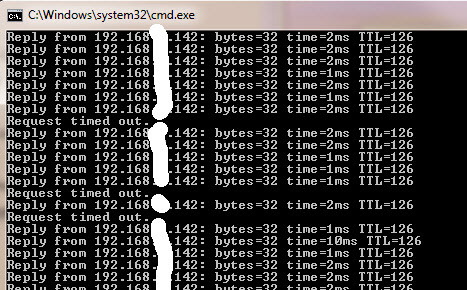 Do a continuous ping, and the issue is fixed! Next, via Remote desktop into the hyper-v server and controlling the machine that way (not remote desktop connecting into the VM itself…) I switched the machine to a static IP, which was different than the DHCP assigned one. The above fix (changing to Static IP) alleviates the need to fiddle with the VM’s Hardware Acceleration settings, such as VMQ (Virtual Machine Queue) or the Enable IPsec task offloading. On my Hyper-V server both of these are “CHECKED/ON”.